Lindab Innovation Hub and Best Western Hotel Duxiana in Helsingborg have started to collaborate on a joint project. Together, they will analyse the indoor climate of the hotel, and at the same time, raise awareness of its importance. "Room climate is extremely important, and we hope to get this across to people," says Johan Knutsson, owner of Hotel Duxiana. Lindab Innovation Hub highlights indoor climates with a mini exhibition at Mindpark in Helsingborg. The aim of the exhibition is to increase knowledge of the indoor climate. "We want to raise awareness and get people to reflect on how important this issue is," says Nicklas Friberg, Head of Lindab Innovation Hub. Lindab is Sweden's leading company in the field of ventilation and indoor climate solutions. Now the organisation is opening a new research and development facility in Helsingborg, Sweden – the Lindab Innovation Hub. 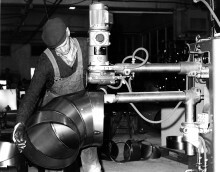 On February 6, 1959, AB Lidhults Plåtindustri was founded in Grevie in northwestern Skåne by Lage Lindh and Valter Persson. It was the start of the company that 10 years later was named Lindab AB. Since then Lindab has grown to become a multinational company on the stock market. When the company turns 60 on February 6th, a piece of Swedish industrial history will be celebrated at the same time. Lindab's full range of roof safety products is now available at BIMobject Cloud, the world's largest and fastest growing platform for digital copies of building products. The agreement is a step in Lindab's long-term digitalisation efforts. Lindab and its innovative UltraLink solution won the "Stora Inneklimatpriset", which was awarded during a gala evening for the indoor climate industry at Skansen in Stockholm. The award was presented by Alf Karlsson, State Secretary for the Minister of Housing and Digitalisation, Peter Eriksson (MP). Innovative solution among the four finalists for "Stora Inneklimatpriset"
The four nominees in with a chance of winning the "Stora Inneklimatpriset" have now been revealed. The jury has chosen the finalists from the more than 40 submissions they received. Lindab's innovative UltraLink solution is one of the four nominees. As Lindab only recently introduced their latest revolutionary invention Lindab UltraLink to the global HVAC business and haven’t even introduced it to the UK market it´s a tremendous achievement to be shortlisted for the 23rd final of the longest running awards in the building industry in the UK. On November 28th, Lindab France received the prestigious Excellence Award PME for 2016 (Prix d'Excellence), given by the Swedish Chamber of Commerce in France. Lindab France was awarded in the small and medium enterprises category, for its significant achievements in the French market within Sustainable Development. Lindab has recently decided to act as lead sponsor for Maria Rooth Summer Hockey School, one of Sweden's and Europe's largest hockey schools. "It is an important sporting activity, which gives young people knowledge, experience and the opportunity to meet and encounter other cultures and sections of society", says Anders Berg, President and CEO of Lindab. REHVA World Congress CLIMA 2016 took place on 22-25 May in Aalborg, Denmark. The congress is the leading international scientific congress within HVAC and construction. Scientists, engineers, architects and other experts gather here to find out about the latest research and developments with one clear goal: to improve quality of life and the indoor climate of future buildings. Ventilation and building materials company Lindab is replacing it's 700 diesel and petrol-driven vehicles with plug-in hybrid cars. Now the first cars are on the roads.